A doctor has been banned from prescribing drugs and told to take down part of her website after appearing before the General Medical Council. 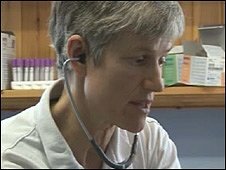 Dr Sarah Myhill will have to comply with the order for 18 months after two complaints were made against her. She has a private practice near Knighton, Powys, where she specialises in treating chronic fatigue syndrome. Her supporters were outside the hearing in London and claimed she was the victim of a witch-hunt. There have complaints against her on seven occasions since 2001, but this the first time Dr Myhill has appeared before a General Medical Council (GMC) panel. Before the hearing, she said that she could not understand why complaints against her were being heard. But the chair of the GMC panel said there serious concerns about the potential risk to patients and her fitness to practice would continued to be reviewed. One of the complaints was on the content of Dr Myhill's website, which warned patients against oral contraceptives, the MMR triple vaccine as well as mammogram tests and biopsies for cancer. 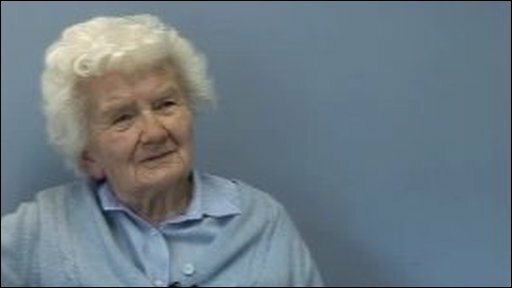 But Dr Mygill says she tries to find the causes of a disease, rather than treating the symptoms with drugs. The GMC considered whether there might be "impairment of Dr Myhill's fitness to practise which poses a real risk to members of the public or may adversely affect the public interests or Dr Myhill's own interests". But her supporters say no patient has ever complained about her. Dr Myhill runs a website which gives information on allergies and hormones, and advocates what she calls a "stone age diet" for people suffering from myalgic encephalomyelitis (ME) and other complaints including chemical sensitivity. She treats people from across the UK. However it is the website which has prompted the latest complaints against Dr Myhill. She said in a statement on her website that a group of doctors have complained about her recommending a B12 vitamin injection to a patient. A second complainant said the information on her website was "very worrying" and was concerned "patients are being seriously misled". 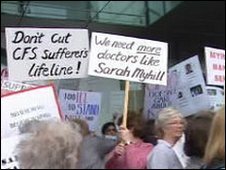 Six previous complaints have been made by other doctors against Dr Myhill since 2001. She told BBC Wales: "I think there's a small group of doctors who perceive me as a threat to their professional integrity in some way and that is certainly not my desire to in any way threaten them. "My motive is purely to help the patient to get well in as safe a way as is possible." Patricia Chell has been travelling back and forth from Shropshire for three years to receive treatment, and says her health has improved dramatically since being prescribed magnesium by Dr Myhill. "I think it's dreadful, and in fact if she's suspended, my life's at stake - literally. "Without this magnesium, I should eventually get heart failure again."